Wicksteed Park’s annual fireworks extravaganza will provide a magical event for all the family when it returns for its 17th fantastic year – and we are giving you the chance to win FIVE sets of family tickets. 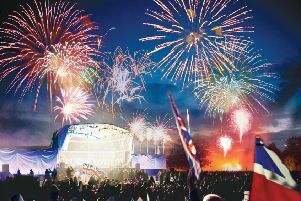 Award-winning fireworks champions MLE pyrotechnics, from Daventry, are lighting up the sky above the park for one of the region’s best displays, on Saturday, November 3. A giant wicker Wickyman statue will come alive with fireworks before being burnt ahead of the main bonfire being lit. This year the statue is based on the Greek god Hermes. One of the cleverest and most mischievous of the Olympian gods, he was also their herald and messenger. The event is being partnered by Heart radio and they will be represented by drivetime presenter Gareth Wesley on the night. Gates open at 5pm, with the bonfire being lit at 7.15pm and the fireworks display at approximately 8pm. Tickets are £5.00 on the night, but only £4 until October 29 and babies under 12 months go free. All proceeds are reinvested into the park and developing it for the community. Musicians from Tresham College will entertain the crowds and music will be supplied by Big Bopper Entertainment. A disco for families is included in the admission price and will be held in the Pavilion straight after the fireworks, until around 10.30pm. MLE are one of the world’s top firework display teams and have previously been crowned British Champions and come second in the World Championships. Car parking for the event is free but people are advised to arrive early, as it does get busy. For your chance to win tickets for a family of four, just answer the following question: What Greek god is the bonfire night statue named after? Email your answer to hello@wicksteedepark.org and mark it Peterborough Telegraph competition in the subject line. Competition closes at 00.01am on Wednesday, October 31.